“Fantasy is a necessary ingredient in living, it's a way of looking at life through the wrong end of a telescope.” Dr. Seuss’s words could almost be a mantra for Tim Walker, the photographer whose superlative work and eye for extraordinary and beautiful detail has created some of the best-loved fashion photography of the last ten years, and a large scale exhibition last year at Somerset House. 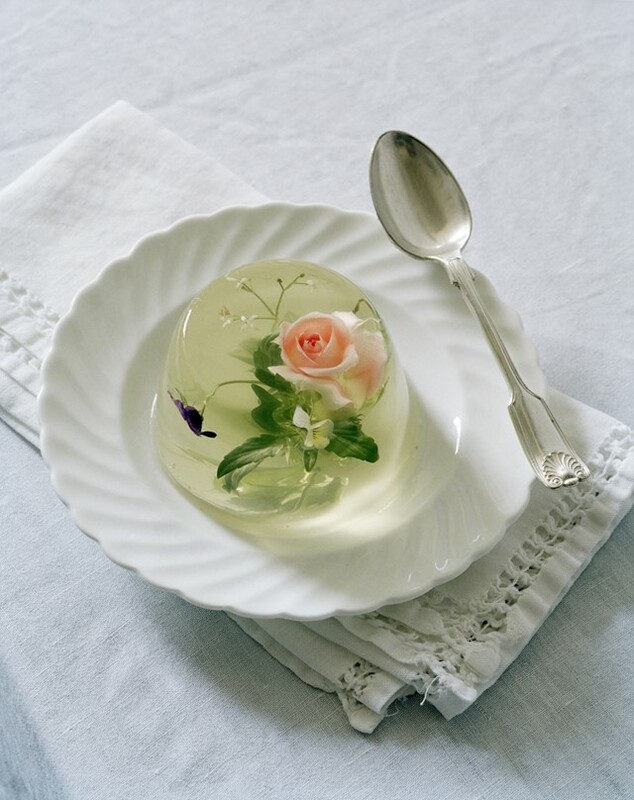 This week’s Most Loved post hones in on just one small detail from his work: an exquisitely fantastical panna cotta (or rather rosehip and borrage flower set in jelly), made by art director Rhea Thierstein and Loved by photographer Olena Slyesarenko. At AnOther, we like our food extraordinary. Summer was spent dreaming of flower meadow ice lollies; for autumn, we attempted to recreate Lily Vanilli’s seasonally decorated cake; and chilly December was warmed with a multitude of festive crumpets. The arrival of Spring, heralded by tantalising moments of sunshine, and the hysterical promises of newscasters that Sunday will find the UK “hotter than Ibiza”, seems to be the perfect moment to try and recreate Walker’s perfect pudding. But, before we start roaming the shops on the hunt for borrage and rosehips, and buying suitably fantastical cutlery with which to serve it, we ask Slyesarenko what inspired her beautiful love, and who she’d invite to eat it with her. Why did you love this panna cotta? Because it's a piece of art – it makes me think of a beautiful antique paper weight. On the lightest porcelain plate, on the table with antique faded lace linen. Who would you serve it to, and what would you wear to the dinner party? The first people who spring to mind are Neil Armstrong, Cate Blanchett, Jennifer Lawrence, Robert Plant, Emma Thompson, Oscar Wilde, Marilyn Monroe, Sylvia Plath, Tennessee Williams, Winston Churchill and Margaret Thatcher. I'd love to wear something feminine but 'dark' like Tim Walker's work – this dress by Givenchy would be perfect. What's your favourite Tim Walker shoot/detail/set/story? It's a tough one – but it has to be Tilda Swinton for W Magazine. The dream team with Jacob K styling and Las Pozas setting. What's your favourite food scene in a film? Probably spaghetti sharing in Lady and the Tramp or the cupcake scene in Once Upon a Time in America. I love most of the flowers – unfortunately they don't love me. My peace lily is the only one that survived so far. Ladurée macaroons in rose, orange blossom and salted caramel. That would possibly be my last meal. What are you looking forward to for March? Hopefully the victory of the Ukrainian people – it's been a painful four months so I hope their dreams will finally come true in March. On a more cheerful note, Wes Anderson's new movie The Grand Budapest Hotel is surely something to look forward to. A beautiful carafe by Nina Jobs that I have wanted for so long.